What's that I see on my citrus tree? Have you seen this on your citrus trees lately? It’s evidence of the citrus leafminer. The larval stage of the moths create these mines under the surface of the leaf, leaving what looks like sticky trails all over the leaves. This will be evident on new growth only. When the larvae emerge from the leaf, they then roll themselves under the edge of the leaf to pupate. This is why the leaves will appear curled and distorted. These citrus pests are very common is Southern California, and are unfortunately almost impossible to avoid. The good news is, there are many natural predators in our environment that prey on these insects. 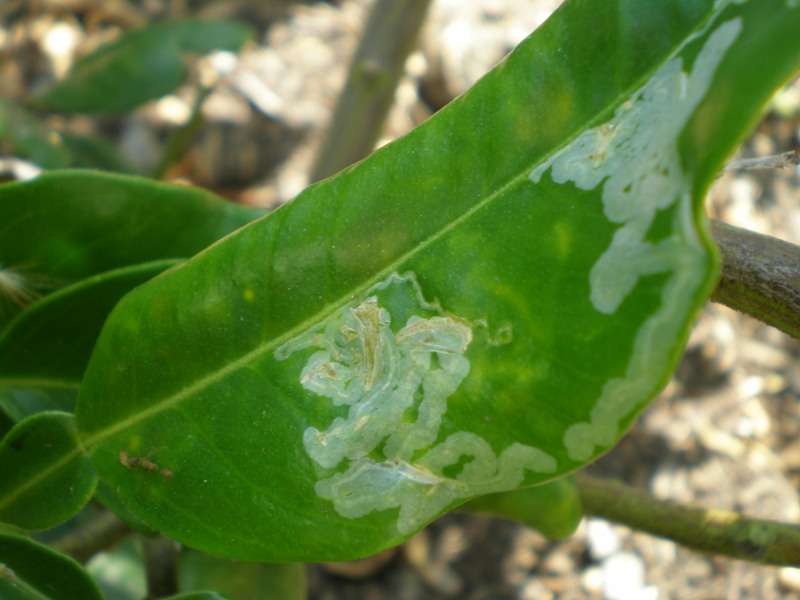 On mature citrus trees, it is not necessary to treat leafminers, because there are many more older leaves which they will not infest, and only minimal newer leaves for the leafminer to feed on. If you have a younger tree with a bad infestation, however, I would advise treating it with spinosad, and organic insecticide that will treat leafminers as well as several other citrus pests. We carry Monterey Garden Insect spray here at the nursery, which contains spinosad. A friendly reminder: never use sprays on your plants when it’s over 90 degrees outside. Early morning or evening only if you need to spray anything at this time of year. A note: Much of what I have shared here about leafminers was my own personal knowledge from working at the nursery. I also used imp.ucdavis.edu for more technical info on leafminers. And I learned a little more about them myself!